New York : Viking, 2011. Documents a 2003 experiment at Duke University where the author had free iPods issued to the freshman class to see how the device could be used academically, in a report that reveals other technological ideas that are revolutionizing education. Halfway through this book I would have given it 4 stars, but then I got to the section on work, which is frustratingly utopian. This is a very interesting book, but I feel the title is a little misleading. It’s not so much that brain science will transform how we do things; it’s more that technology will. In a world where the boundaries between work and personal life have been broken down by constant email, texts, and cell phones; where classrooms have been infiltrated by iPods and homework over the internet; where people all over the world are working to produce the largest, constantly changing, encyclopedia; and where many jobs require skill sets that didn’t even exist 25 years ago, the way people are educated has to change. That seemed to me to be the main thrust of the book. This is not the first time that technology has changed the way people learned and thought. The steam powered press and machine made ink and paper put books and magazines into the hands of the middle class for the first time. Everyday people could learn things that they had no direct physical contact with. This was a revolution in education. The education system we use today was designed near the start of the machine age, an age of factories that created identical things, and wanted workers who behaved in identical ways. That’s not the way the world works today. In a lot of jobs, people need the ability to create, not do the same task over and over again- although these are higher paying jobs for the college educated, not the McJobs that so many of us are stuck in; the author is dealing with ‘thinking’ jobs in this book, not service jobs. Davidson believes that the schools must change to make education fun and interesting for the students; children usually feel that ‘learning’ is unpleasant when asked about it, but will happily learn from a video game, and in fact deny that they were learning from it. The author also feels that many of the children diagnosed with ADHD are simply not being taught things that interest them, and are far from hopeless in the classroom- provided the classroom changes to meet their needs. She’s not denying the need for learning basic skills- reading, writing, math- but feels these things need to be taught differently. Sadly, in an era where funding for schools is being cut back, I don’t see that these changes will take place in the near future. She also points out that our beliefs changes how we perceive things; the student that we feel has ADHD and should be medicated if we see them in a reading class we might think was a genius if we see them first in an art class; memory lapses are ignored when young people make them but are seen as signs of dementia when someone over 45 has them. We need to become more aware of our preset beliefs to see things as they really are. Don't be fooled by the cheeky title. 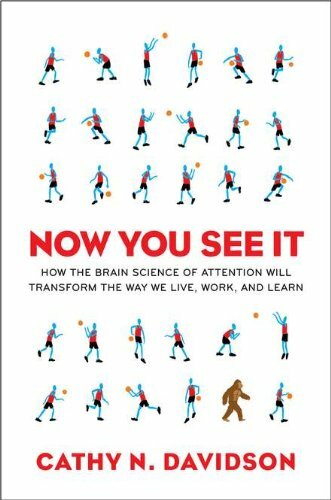 In "Now You See It" Davidson manages to bridge research from neuroscience, education and business together to create a truly unique explanation for how our brains are changing in the post-internet age and how our schools and workplaces are slowly (and they are very slow) catching up. •	Sometimes “pilot” can be just a label you give a project when you want a soft launch—might be better to leave expectations more open so that you won’t overlook unanticipated findings? •	She has a “strengths based” approach to a happy life, which I agree with. But I wonder if specializing too early, saying “I’m not good at that, interested in that” might cut off options later? Don't most jobs, relationships require that you be out of your comfort zone some of the time? •	Everyone needs to think "how can I jolt myself out of my routines so that I might see other options, areas for growth based on new technologies and opportunities?" •	Many of her examples of good environments for learning and working seem to come down to having truly engaged teachers and bosses—the exact techniques may matter less than just having someone thinking, aware, trying? •	It's a hopeful idea that if you think you are good at something you may actually be better at it than if you don’t. Believing clichés and excuses about getting older actually could make them come true? •	"If there is any word that defines the twentieth century, it might be normative: a defining and enforcing of standards of what counts as correct."